Another fun freebie from Alma Loveland: a graphic you can download, print, and frame under glass in your kitchen, then use a dry erase marker to write your meal plans on it. The print will fit in a standard IKEA Ribba frame, or you can scale it to a smaller size if you prefer. A housewarming gift for a cook, perhaps? 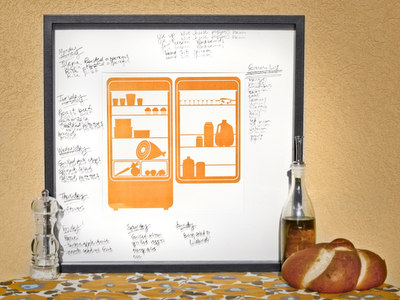 Also check out Alma's fridge design, available in her Etsy shop. I have a weakness for orange refrigerators. These are so clever! Great find! this is great... my weekly menu is done in an excel sheet so this is going to be a very nice addition to my kitchen! i looove this! what a great idea. Been looking for something similar. Will definitely frame under glass for our new house's kitchen! Thanks so much. What a great idea, I love this! My brother is getting married in August. This is the perfect addition to the kitchen themed gift I am giving them. What a great idea! This is seriously cute! You could also laminate it too and use a dry erase marker. Great idea! I love this...heading over there now! Thanks for sharing. You always find the coolest ideas! This would make a great budget wedding shower gift. If you are a bridesmaid and get invited to 4 different showers then it can get quite spendy to go. This could be a great fill in gift. I'd love to have it in my kitchen, thanks! ha! LOVE the fridge art! Adorable! Those would make great individual refrigerator magnets too! Hmmmm...the possibilities! I am a first time visitor and I love this blog! Great ideas AND great color!! My family name is Orange. Which, by the way, is the name of the Dutch royal family (and the Dutch national color) too. This is GREAT! I LOVE it and will do something with it for sure! Love the free menu download. 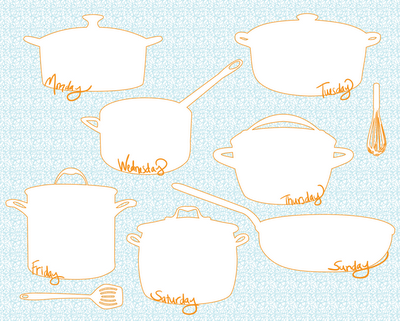 We've recently been planning a week's meals at a time and this will be much cuter than the little scraps we use now! Thanks! ah! what a fabulous idea! perfect for a weekly meal planner geek like myself! Great idea for the dry erase framed art! I've been menu planning for a long time, but on an ugly grid...I love your graphics much better! Great idea! can't wait to print and frame it. Thanks, just what I was looking for. Had it laminated and now it's on my fridge door. Ohhh!! I love the orange fridge!